This fantastic villa sleeps up to 7 people. The villa is set on an elevated position with uninterrupted views of the clear blue Mediterranean. The large open plan lounge / dining area has large bay windows ovelooking the pool. 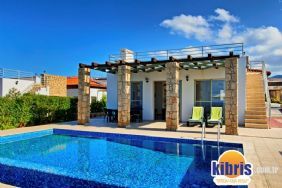 This tastefully furnished villa has airconditioning and marble flooring throughout. There is extensive terracing so you can take your pick of where to soak up the sun or find a quiet corner to chill out with a glass of wine and a good book! There is a barbecue with dining and seating facilities included. There are 2 double bedrooms (1 en-suite) plus a further 2 single bedrooms (1 en-suite)- 1 of which has an extra pull-out bed. 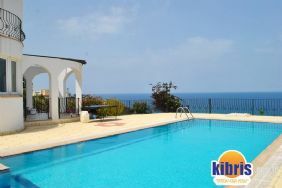 Korineum golf course is a 10 minute drive from the villa.